In 2010 the McKinsey Global Institute (MGI) described the potential and progress of African economies as “lions on the move”. Today, despite the collapse of global commodity prices and political shocks that have slowed growth in North Africa, Africa’s economic lions are still moving forward. Overall, the continent achieved average real annual GDP growth of 5.4% between 2000 and 2010, adding $78 billion annually to GDP (in 2015 prices). But growth slowed to 3.3%, or $69 billion, a year between 2010 and 2015. Has the shine come off Africa’s growth story? New research from the MGI that will be published in full in October concludes that the answer is no, but it is clear that the continent’s growth story has become a more nuanced one. The deceleration in Africa’s growth since 2010 has been concentrated in two groups of economies – oil exporters and northern countries still rebuilding after the political convulsions of the Arab Spring. The economies of Egypt, Libya and Tunisia did not grow at all between 2010 and 2015, in stark contrast to average annual growth among the three economies of 4.8% in the previous decade. The rate of growth among oil exporters such as Algeria, Angola, Nigeria and Sudan fell sharply to 4% from 7.1%. Productivity growth also declined in these two sets of economies. 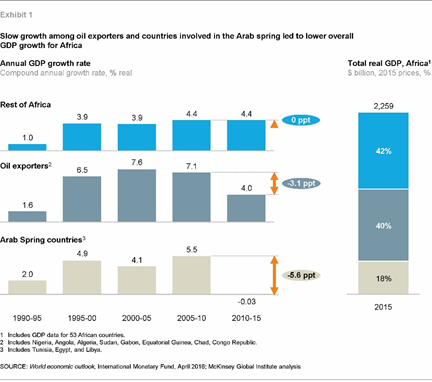 The annual rate of productivity growth in the Arab Spring countries fell from 1.7% to 0.6%, and in Africa’s oil exporters from 2.6% to 0.4%. Despite this deterioration in the performance of key economies, the rest of Africa was able to maintain stable rates of GDP and productivity growth over the past five years. Real GDP grew at an annual rate of 4.4% a year, virtually the same as in 2005 to 2010. Productivity grew at a compound annual rate of 1.7% over the same period, consistent with 1.6% from 2000 to 2010. The resilience of large parts of Africa in the face of challenging conditions reflects continuing diversification in many of the continent’s economies. Between 2010 and 2014, services generated 48% of Africa’s GDP growth, up from 44% in the preceding decade. Growth in Africa’s manufacturing sector has been low at 4.3% a year between 2010 and 2014, but utilities and construction achieved significant expansion to ensure that industry overall generated 23% of Africa’s growth, up from 17% in the preceding decade. Resources made a negative 4% contribution to growth between 2010 and 2014, compared with a positive direct contribution of 12% during the previous decade. In the long term, three powerful positive trends are likely to sustain Africa’s growth. First, the continent has a young population with a growing labour force – a highly valuable asset in an ageing world. In 2034, Africa is expected to have the world’s largest working-age population of 1.1 billion. In recent times, it has had some success in creating jobs – 21 million new stable (formal, wage-paying) jobs over the past five years, and 53 million over the past 15. Stable jobs grew at a rate of 3.8% between 2000 and 2015, 1% faster than growth in the labour force. This is still far from the job-creation trajectory Africa needs to fuel future growth, but it is progress. 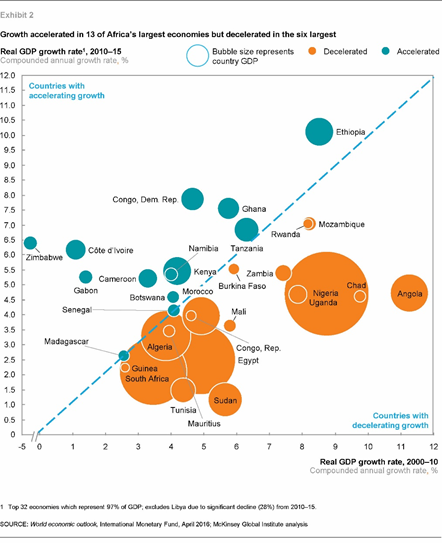 Second, Africa is still urbanizing and much of the economic benefit lies ahead. Productivity in cities is three times as high as in rural areas and, over the next decade, an additional 187 million Africans will live in cities, according to the United Nations. This urban expansion is contributing to rapid growth in consumption by households and businesses. Household consumption grew at a 4.2% compound annual rate between 2010 and 2015 – faster than the continent’s GDP growth rate – to reach $1.3 trillion in 2015. We project Africa’s consumers will spend $2 trillion by 2025. But companies will need to gather detailed market intelligence on where the most promising consumer markets are. Just 75 cities accounted for 44% of total consumption in 2015. Nigerian consumers alone may account for up to 30% of Africa’s consumption growth over the next decade. Other segments to target include households earning more than $20,000 per annum in South Africa and Morocco, two of Africa’s most diversified economies with a large consumer base, or those earning $5,000 to $20,000 in some of the fast-growing economies of East and West Africa. Third, African economies are also well positioned to benefit from rapidly accelerating technological change that can unlock growth and leapfrog the limitations and costs of physical infrastructure in important areas of economic life. East Africa is already a global leader in mobile payments. Penetration of smart phones is expected to hit at least the 50% mark in 2020 from only 2% in 2010. In Sub-Saharan Africa, cellular-enabled machine-to-machine connections are expected to grow by around 25% per annum to 30 million by 2020, according to GSMA Intelligence, changing the game in sectors from healthcare to power. Reinforcing the positive outlook for growth is a continuing rise in infrastructure investment. Spending on infrastructure has doubled over the past decade, and now stands at 3.5% of GDP. Foreign investors have taken note of such positive fundamentals. Foreign direct investment reached $73 billion in 2014, up from $14 billion in 2004. Africa is today home to 700 large – and increasingly pan-African – companies earning revenues of greater than $500 million. These companies together boast $1.4 trillion in revenues, and many continue to grow very fast. Large companies in utilities, transportation and healthcare have achieved double-digit revenue growth in local currency terms between 2008 and 2014. Despite the continued potential of African economies, policy-makers undoubtedly will need to grapple with significant challenges ahead. As the price of oil and other commodities has fallen, Africa’s finances have deteriorated: the continent ran a weighted average budget deficit of more than 6.9% of GDP in 2015 from only 3.3% of GDP five years earlier. In 2010, Africa as a whole was running a small current-account surplus of 0.4% of GDP; by 2015, that had turned into a deficit of 6.7%. As we write this, several African countries are in talks for financial assistance, including Angola with the IMF and Nigeria with the Chinese government. Political instability is also more prevalent. The number of violent incidents measured by the Uppsala Conflict Data Program has jumped from 858 in 2010 to 2022 in 2014. The challenges in some parts of the region have taken their toll. Five years ago, most of Africa was booming – 25 of the top 30 economies had accelerated their growth from the previous decade. 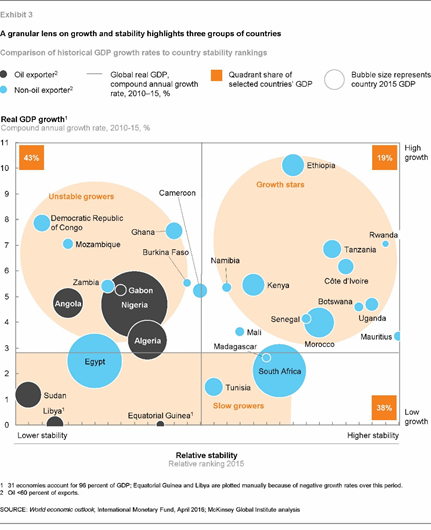 In 2016, however, the number of countries whose growth was similar or quickening has halved to 13 – Botswana, Cameroon, Côte d’Ivoire, the Democratic Republic of Congo, Ethiopia, Gabon, Ghana, Kenya, Madagascar, Namibia, Senegal, Tanzania and Zimbabwe – and Africa’s six largest economies have experienced slowing growth, partly reflecting lower resource prices and the Arab Spring. This mixed picture means that companies and investors assessing Africa’s potential need to be a lot more specific about the growth and stability of individual countries. We have measured three aspects of stability: macroeconomic stability, economic diversification, and political and social stability. Three distinct groups of countries emerges from this analysis. About one-fifth of Africa’s GDP comes from a set of countries we call growth stars, with high rates of growth and a high score on stability. These countries, among them Côte d’Ivoire, Ethiopia, Kenya, Morocco and Rwanda, are not dependent on resources for growth, are actively reforming their economies, and are increasing competitiveness. A second set of countries, the unstable growers, which account for 43% of Africa’s GDP, have experienced high growth rates over the past five years but lower scores on stability. This group includes countries such as Angola, the Democratic Republic of Congo, Nigeria and Zambia, all of which have clear potential but need to diversify their economies away from resources, to improve their security, or stabilize their macro-economies. Finally, there are the slow growers that accounted for 38% of GDP in 2015; this group includes South Africa, Madagascar and the three major North African countries involved in the Arab Spring – Egypt, Libya and Tunisia. The imperative now is for policy-makers and businesses to work together to accelerate economic reforms and strengthen the fundamentals that underpin growth. One priority will be to diversify exports and national revenue sources to eliminate the volatility that arises when resource prices change dramatically. This is critical for increasing Africa’s ability to finance its own development by better mobilizing domestic resources through better tax and customs collections and finding ways to encourage more savings. This will require countries to increase pension provisions, expand access to banking and financial services, and deepen their capital markets. Better planning around urbanization is critical to unlock the full growth opportunity and to make African cities competitive. A stronger focus on expanding power supply and electricity is needed to solve what is the number one challenge to the business environment. Three other areas vital to growth also deserve focus – improving educational systems to develop the skills needed now and into the future, further efforts at regional integration to unlock regional manufacturing and trade, and improving Africa’s physical and digital infrastructure. The turbulence – both economic and political – in parts of the continent in recent years has doubtless been a shock, but it has not derailed Africa’s growth story. The IMF still forecasts that Africa will be the second-fastest growing region in the world between 2016 and 2020 with annual growth of 4.3%. What the past five years have proved, however, is that Africa’s economic lions need to improve their fitness in order to make the most of their potential and continue their march towards prosperity. The McKinsey Global Institute’s new report on Africa, Lions on the move 2.0: The continuing progress of Africa’s economies will be published in October 2016.